We've secured procurement savings and process optimization for facilities of all shapes and sizes. But don't take our word for it, check out our case studies and hear what our customers have to say about our supply chain planning success. Essilor, manufacturer and wholesale distributor of optical lenses, reduced total procurement costs by 28-30% across 135 U.S. locations. Uncover their secrets to success. Discover how Sun County Airlines, an air transportation company, eliminated ineffective systems and positioned themselves to expand into new locations across the country. Leading manufacturer of engineered metal products, Peterson Spring, achieved 6% savings across their procurement department. Learn more about their supply chain planning success. With the help of the AFFLINK procurement strategy experts, national janitorial services company Frantz Building Services, secured bottom line savings and streamlined operational processes. 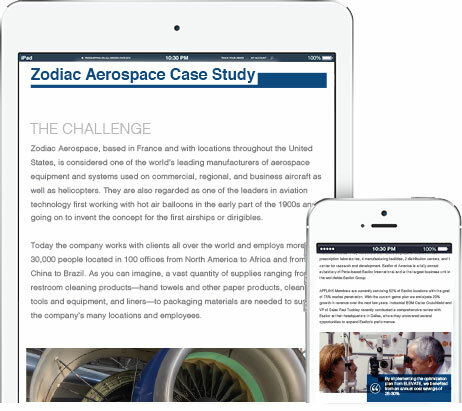 Explore how Zodiac Aerospace, provider of aerospace equipment and systems, optimized their procurement strategy and lowered supply chain expenses by 17% across 100 facilities. National health care organization, Adventist Health System, standardized procurement procedures resulting in cost savings of over $200,000 in one year. Get their full story here.